So many businesses rely on towels to help make better customer and employee first impressions. If you run a hair salon, day spa, nail salon, pet grooming service, hotel, bed and breakfast, car wash, health club, gym, country club or a similar type of company, you want the best towels you can get at economical prices. At Towel Super Center, we’ve amassed the largest selection of towel types, dimensions and colors on the Internet. Not only do we make it simple for you to find the right wholesale towels you need to get all your jobs done, but we competitively price our merchandise so you don’t spend too much. 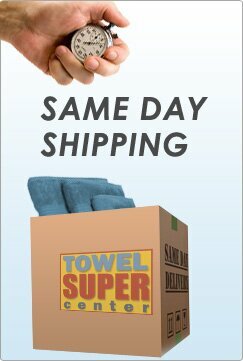 Order the preferred number of towels for your business today and have them shipped to your organization fast. Did you know the towels your employees or guests use can be an extension of your business’s marketing and branding efforts? Consider the bad first impression that a raggedy, unpleasant towel promotes. People not only don’t want to use towels that seem like they’ve seen better days, but they associate those lackluster towels with your company. That makes it harder to win over customers. To build loyalty, carefully consider the towels you’re offering to your staff and the public. The right weave, the type, size and quality of the fabric all present a specific image. Even if you choose a 100-percent cotton towel in the economy category rather than a deluxe or premium version, you’ll still have a leg up on the competition. 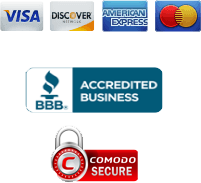 Each towel offered at Towel Super Center is extremely affordable and durable. That means you’ll still make a good impression, even though you’re not going over your budget for linens. Do you have a special theme for your business? For instance, is it decorated in neutrals? Rather than choosing a neutral wholesale towel type, you could always opt for a vibrant, colorful towel to add a splash of visual interest. On the flip side, if you operate a business that has one color scheme, such as red, yellow or purple, you’ll want to get towels that match closely with them to represent your brand. Towel Super Center has a wealth of towel types and colors, some of which are even bleach-resistant and bleach-safe. You can mix and match according to your décor and needs. As an example, if you run a hair salon and your towels are constantly in contact with bleaching agents such as dyes, certain beauty products and other cosmetics, you don’t have to give up your dream of having colorful towels — our bleach-safe plush, 100-percent cotton towels are a great solution. Why compromise with other suppliers of wholesale towels for businesses? Towel Super Center is here to treat you right and help you grow your business by having a great stock of towels ready for your needs. 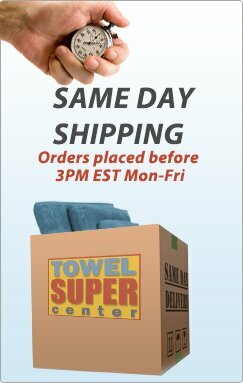 Order your wholesale towels today in as many units of one dozen as you need. The more you buy, the lower your per-towel cost will be.